Unless you live under a rock or don't even know any children under the age of 10 (or musical geeks of any age), you've heard of Disney's Frozen. Frozen is sort of an obsession in the Pop Cuture Household. We saw the movie on opening weekend, even though we had no idea from the piss-poor marketing what the movie was about. We assumed it was about a reindeer and a snowman—doing what, we did not know. But a coworker of Pop Culture Dad saw the movie with his five-year old daughter on opening day and had given us the recommendation that, since we are all crazy over musicals, we would love it. He isn't even a Broadway fan, but downloaded the soundtrack as soon as he got home and had already memorized one of the songs. 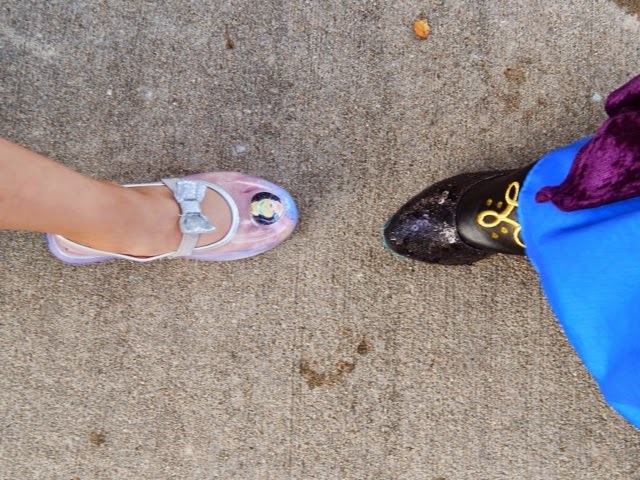 Like most people, we instantly fell in love with Frozen. We saw the movie two more times in the theater (once, courtesy of a ton of free tickets after redeeming our Disney Movie Rewards; the other, the weekend the sing-along version was released). We listened to the soundtrack every day. We made a YouTube playlist of the videos and other clips and watched it every day (sometime multiple times a day) while we waited for the release of the DVD. 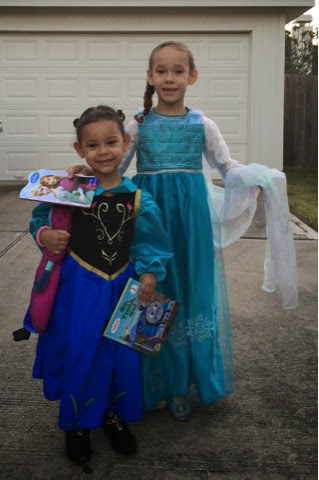 Even before the record-breaking shortages on Frozen merchandise, I had decided I wanted to make my own Elsa and Anna costumes. 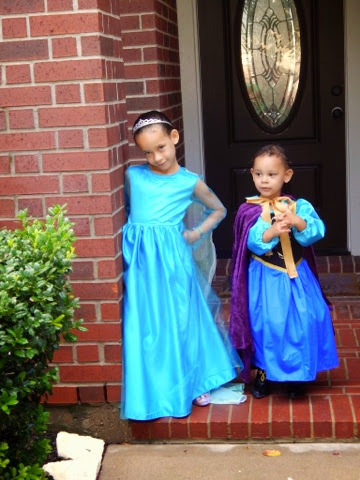 Other than having really gotten addicted to sewing, my main reason was that I hate the Disney official dress-up costumes. We have bought several, and the results are always the same: it looks great in the store, but at some point during the first time it is worn, the dress comes completely unraveled and looks like crap (not to mention there are random strings and bits of elastic all over your house). For $30+, I'm not a fan of something that doesn't even make it through the first wear. So I wanted to make something more durable than what you usually find in the toy aisle. 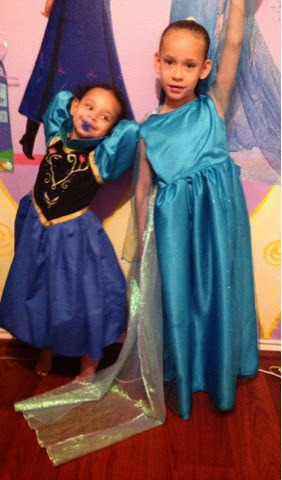 I often looked at Etsy for inspiration on what I would do once I finally settled down and made my own Frozen costumes. One thing I noticed right away is that I hated the Queen Elsa dresses for little girls that were exact replicas of the original. For adults, I think they are fantastic and beautiful. However, when it comes to little children, though I am the furthest thing from a prude, I think the sight of a little girl in a skin-tight dress clinging to her non-existent hips is a little sick. I loathe kiddie pageants, and the whole thing is a little too Toddlers in Tiaras for my taste. 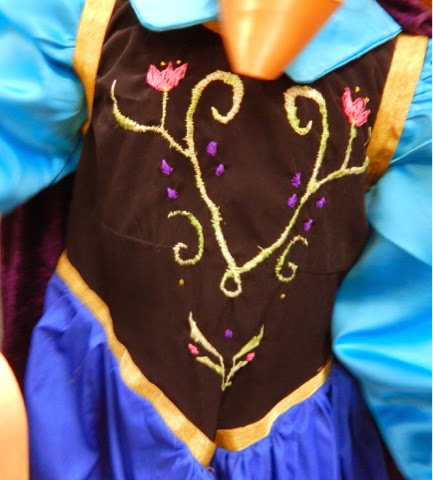 I loved all the Elsa dresses that were true to the original spirit, but clearly made for a child's body. For some reason, I decided the Princess Anna dress would be the easiest of the two to make first. I don't know what I was thinking. Even ignoring the embroidery (which I did by hand over several days), the sheer number of colors and layers made Anna the more difficult of the two. In fact, at the end of the day, Elsa was easier… much, much easier. 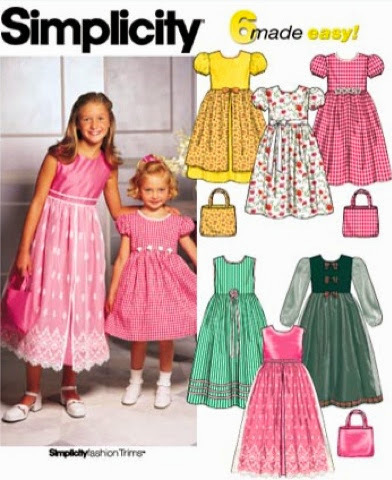 As far as the patterns used, I semi-frankenpatterned these dresses. The Anna dress is primarily the base of Simplicity 9497 with the collar taken from another costume pattern. I lengthened the skirt considerably. There is no lining or overskirt and definitely no bows. 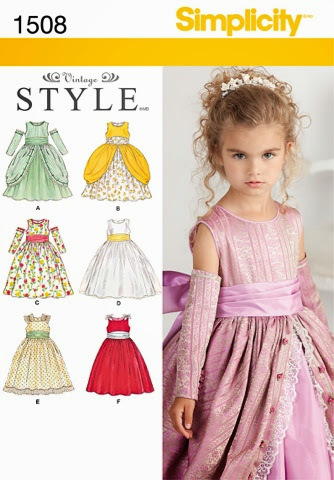 Instead of making a separate shirt, vest, and skirt like Anna's, I made it all one dress with varying fabrics. The gold trim is ribbon. The hand embroidery is the last thing I did (in fact, I just finished it last night, even though the dress has been sewn for a couple of weeks now and I both started and finished the Elsa dress in between). I don't own an embroidery machine and wouldn't know how to use one if I did. In fact, freshman year of college I got fired from a holiday job at an embroidery shop, because I was that bad with machines. However, I've been cross-stitching since I was 10, so I figured, "What the hell? I'll give it a shot." My embroidery isn't perfect by any means. Heck, anyone who is as Type A as Pop Culture Dad generally is when it comes to symmetry might consider it a hot mess, but I'm still proud of it! And it's for a toddler. Elsa was much more simple. This dress is primarily Simplicity 1508 (D). In fact, other than skipping the lining, the sash, and the cording and adding a layer of glittery mesh, sleeves (a modified version of the sleeves I made for the Anna dress), and the cape (which was actually two feet longer before we realized it presented a safety hazard around the house), it is almost exactly the dress. I won't lie, I love this pattern for little girls. It is simple and beautiful and girly and adorable. I may start scheduling monthly tea parties just to have a reason to make a dozen more of this pattern. Little Diva won't mind; she lives [that is not a typo] to dress up. 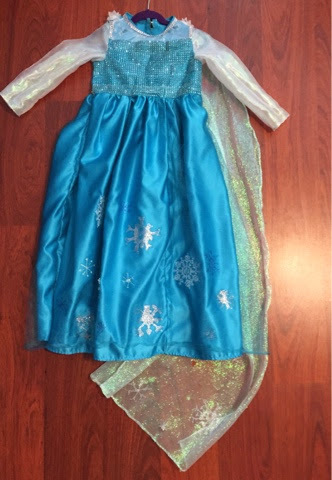 UPDATE: Since the original post, I made some modifications to the Elsa dress. The sleeves were too itchy for Little Diva, so I made new ones after having her test out several fabrics for their comfort fabric. Since I was already "in there," I Elsa-fied the dress with several bead ribbons, glitter paint, and dollar store ornaments. 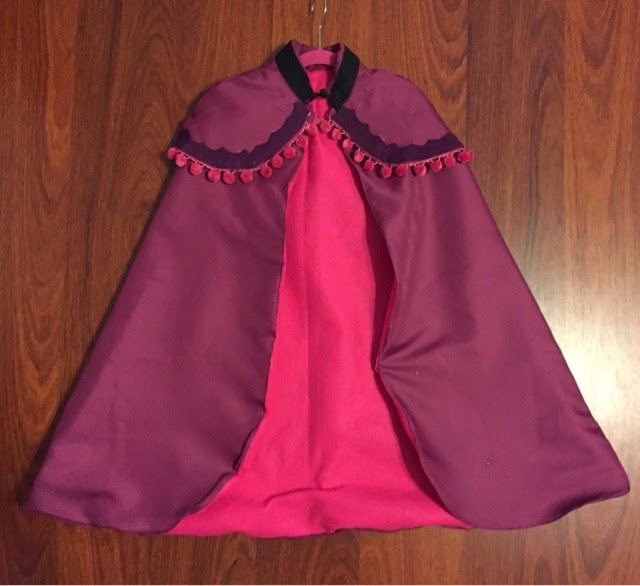 Not to be left out, I also fashioned an Anna cape using the new Simplicity Disney-official Frozen pattern (Simplicity 1220).